NOTE: Luminous Enhancing Sunglasses is "tuned" to work with "regular" Luminous chemicals. Ultra-Luminous uses a very different filter and different chemicals. Therefore, they are not compatable technologies. Good for beginner, intermediate and advanced customers. Luminous products work best on red backed cards. Luminous Enhancing Sunglasses are always easier to use than gimmicking your own sunglasses with luminous filter. Luminous marks appear clearer, under a wider variety of lighting conditions, when viewed through NU-CONcept's patented Luminous Enhancing Sunglasses because the filter is built INTO the lenses vs. placing a luminous filter BEHIND regular sunglasses. Luminous marked cards are very deceptive, yet easy to read close up or across the table when viewed through luminous filtered sunglasses. One pair of Luminous Enhancing Sunglasses with sunglass case which may be attached to your belt. Options: Do you think someone may want to look at your sunglasses ? 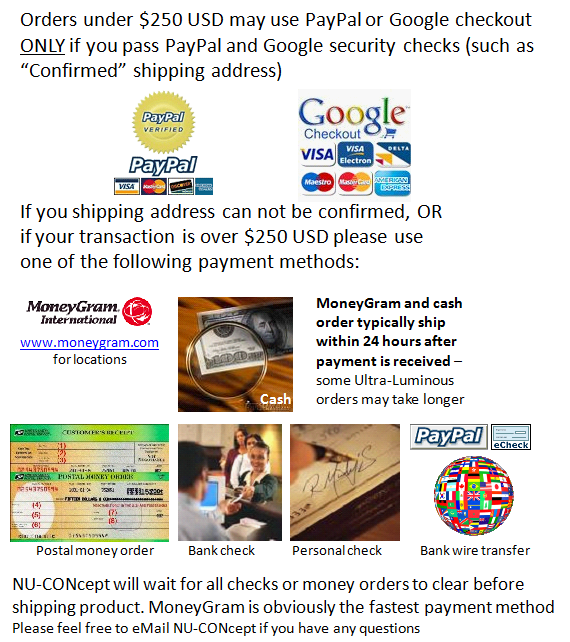 - Don't forget to look at the optional "un-filtered/ungimmicked MATCHING Luminous Enhancing Sunglasses" ($49). Why would you need matching, un-gimmicked, sunglasses ? You can start the evening by wearing the un-gimmicked sunglasses or you can be casually lay them on the table so people can see they are normal. Then you can easily switch the normal sunglasses for your matching Luminous Enhancing Sunglasses to read the marked cards. The easiest way to change the regular sunglasses for Luminous Enhancing Sunglasses is in your pocket or in the bathroom. Later, you can switch them back for the un-gimmicked sunglasses, in case someone wants to look at them.